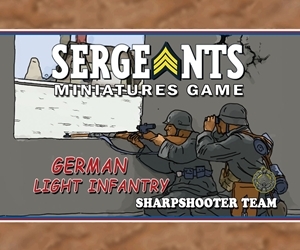 The German Light Infantry Sharpshooters are a new addition to the SMG soldier line. By the time of the invasion, the German Army had reduced the number of rifles in each squad. To compensate they issued the good shots in each platoon a 3x Scope for the Mauser 98 - this led the allies to believe that the Germans had snipers everywhere. Actual trained Snipers were the best shots in the German Army and had that native skill trained to perfection. The Sharpshooter Team comes with 1 trained sniper and 1 "good shot" sharpshooter. In addition to their basic playing cards , they also come with 4-8 new Specialist cards that may include Story, Command, React and all new Equipment cards.